Volunteering with a community group is a fun way to meet new people and feel appreciated. 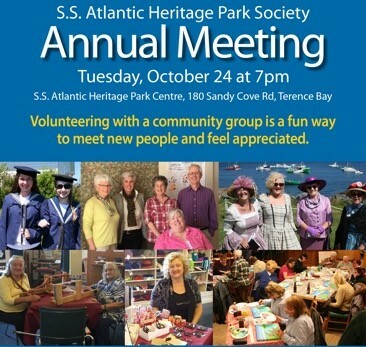 The S.S. Atlantic Heritage Park Society has been in existence since 2001. It began with the Terence Bay Restoration and Development Association in 1981 to clear and re-claim the mass grave site. We now have a park area with boardwalk and gazebo overlooking beautiful Terence Bay as well as an interpretive centre with a small craft shop that is staffed and open to the public from mid-May to October 31. Join us on October 24th to hear about our last fiscal year, goals for next year, meet active members and make new friends.